Whether you’re getting on a bike for the first time or returning to cycling after a break, we have a range of courses that can help you. There are three levels of learning, starting with basic off road training, leading up to quite difficult riding conditions in busy town traffic. Click below to find out more about each course. img=”https://jerseysaferoads.com/wp-content/uploads/2014/03/basic-training.jpg”]Level one courses traditionally known as cycling proficiency, targeted at primary school children aged 10 years. img=”https://jerseysaferoads.com/wp-content/uploads/2014/03/intermediate-training.jpg”]Level two courses focusing on practical ‘on-road’ experience for young people aged 10 years and over. img=”https://jerseysaferoads.com/wp-content/uploads/2014/03/advanced-training.jpg”]Level three courses are aimed at teenagers and adults who want to learn more advanced riding techniques. 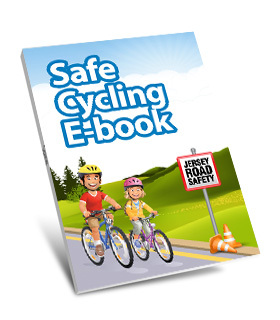 The e-book, although aimed at new cyclists, contains advice that is just as valuable to an older cyclist who is returning to cycling after a break. All the information in the e-book will be covered during one of these courses, but has been produced as on online version for you to take a look at in case you forget. All of the sections in the e-book are available to view online for FREE, use the links below to navigate to the specific sections of the e-book. Ch.3 Does Your Bike Fit You? Ch.4 Are You Ready to Ride? *The full E-book PDF version is correct as of April 2014.